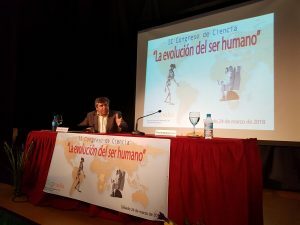 The second edition of the Science Congress was held, with its key topic being the evolution of the human being. This issue, crucial to the understanding of our species, has been investigated from different angles by biologists, scientists and philosophers. Two of the papers that were presented throughout the day were by Antonio Martínez Única, philosopher and scientific publisher and Dr. Manuel Ruiz Torres, biologist. The first one entitled “Human evolution according to the Philosophy of the East” discussed Western theories on the evolution of hominids, and then presented the viewpoint of the ancient philosophies of the Orient, in relation to the human being and its development as a species and as an individual. As a closing to the Congress, Dr. Ruiz Torres with his work entitled “Our natural place: to be more human”, proposed to recover the natural place corresponding to us in the environment to stop being a ruthlessly predatory species, and to learn to cultivate our existence, integrating ourselves in the planet’s ecosystems. Following the presentations, participants had the opportunity to share viewpoints and ask questions to the speakers on the topics addressed.